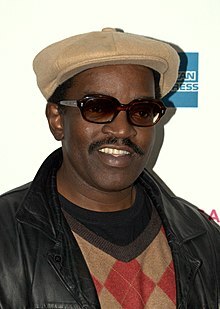 Fred Brathwaite (born August 31, 1959) more popularly known as Fab 5 Freddy, is an American visual artist, filmmaker, rapper and hip hop pioneer. He emerged in New York's downtown underground creative scene in the late 1970s as a camera operator and a regular guest on Glenn O'Brien's public access cable show TV Party. There he met Chris Stein and Debbie Harry. He was immortalized in 1981 when Harry rapped on the Blondie song "Rapture" that "Fab 5 Freddy told me everybody's fly." In the late 1980s, Fab 5 Freddy became the first host of the groundbreaking and first internationally telecast hip-hop music video show Yo! MTV Raps. Bedford–Stuyvesant, New York City, New York, U.S. In the late 1970s, Freddy became a member of the Brooklyn-based graffiti group the Fabulous 5, known for painting the entire side of New York City Subway cars. Along with other Fabulous 5 member Lee Quiñones, under his direction they began to shift from street graffiti to transition into the art world and in 1979 they both exhibited in a prestigious gallery in Rome Italy, Galleria LaMedusa. 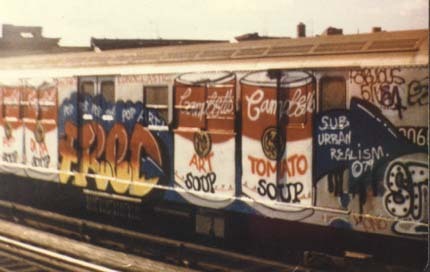 In 1980, he painted a subway train with cartoon style depictions of giant Campbell's Soup cans, after Andy Warhol. He was the bridge between the New York uptown graffiti and early rap scene and the downtown art and punk music scenes. "I was bringing the whole music, hip-hop, art, break dancing, and urban cultural thing to the downtown table," he said. At the end of 1980, Glenn O'Brien cast Freddy, along with fellow Lower East Side graffiti writer Lee Quiñones, in the film New York Beat (later released as Downtown 81). That film showcased artist Jean-Michel Basquiat in his Lower Manhattan environment and the culture that surrounded it. Shortly after, Freddy began production along with filmmaker Charlie Ahearn on his film Wild Style (1982), which showcased artist Lee Quiñones in the Uptown, Manhattan environment of the Bronx and the music that surrounded it. In April 1981, Freddy co curated with Futura 2000 the graffiti-related art show Beyond Words, at the Mudd Club which contained their own work along with Jean-Michel Basquiat, Rammellzee, Keith Haring, Kenny Scharf and others. This was the first time the many members of the Bronx hip hop scene had appeared in the downtown New York City art world. On his relationship with art dealers, Freddy explains, "They didn’t know me, but they had heard of graffiti. But they didn’t understand the importance and the significance of what happened because, see, really what this comes down to is that my background basically is that of a vandal. I vandalize public property....In the real world, in New York, what made graffiti what it is, was the marriage which was the placing of the individual’s mark on that blank surface. But that blank surface that the individual graffiti person tags on, belongs to someone." The following month, Freddy was booked on Henry Chalfant's "Graffiti Rock" performance with Rock Steady Crew at Common Ground gallery in SoHo (not to be confused with Holman's Graffiti Rock TV show pilot). That show was cancelled due to violence, but was rescheduled in October at another venue called The Kitchen. After the Rock Steady Crew and Afrika Bambaataa were booked as the opening act for Bow Wow Wow at The Ritz nightclub in September 1981, Ruza Blue decided to book them at Negril and begin a night called "Wheels of Steel". That became so popular that it was closed down by the fire department for over-capacity, and Freddy helped Blue (whom he dubbed "Kool Lady Blue") find another home for the party. Together they chose The Roxy roller rink in NYC, which gained national fame once used in the film Beat Street (1984). Though Fab 5 Freddy's contributions to hip-hop culture are numerous, perhaps the most historic comes from his 1982 single entitled "Change the Beat". The A-side of the 12" single featured Freddy rapping the song in both English and French, while the B-side was a shorter version of the same song, this time performed entirely in French by rapper Beside, who was credited on the initial pressings of the record as Fab 5 Betty. Freddy utilized a vocoder with a white noise carrier during the chorus and at the end of the B-side track. When the beat stops in Beside's version of the song, Freddy says "Ahhhhh, this stuff is really fresh", a line which is quite possibly the most scratched sample in the history of hip-hop music. It was first utilized as a scratch sample on the 1983 Herbie Hancock single "Rockit", featuring scratching by legendary DJ and turntablist Grand Mixer DXT, and has been used in over 750 hip-hop tracks since. Fab 5 Freddy's "Change the Beat" for Celluloid Records would also lead to four other records, including a song about graffiti painting by Futura 2000 with music performed by The Clash, and all were released together first in France and was soon followed by the first hip hop tour in Europe billed as "New York City Rap", in 1982. The tour consisted of DJ Afrika Bambaataa, Grand Mixer D.ST and the Infinity rappers, The Rock Steady Crew, Futura 2000, Dondi, Phase Two, Fab 5 Freddy, Rammellzee and the McDonald's double Dutch jump rope champs. They played 10 cities in France and did two shows in London. Although at that time no other American hip hop music had been released in France, that now legendary tour sparked the hip hop movement there and France still is the 2nd biggest market for hip hop music outside of America. The movie Wild Style, the first film to illustrate hip hop culture, grew from an idea Freddy had to refute the negative depiction of New York City's urban youth and to link for the first time break dancing, rapping, DJing and graffiti under one umbrella or branches from the same tree. Freddy would connect with New York underground filmmaker Charlie Ahearn at the seminal Times Square Show art exhibit in 1980 and together they began planning the film. Freddy created the film's original music, co-produced and ended up in one of the leading roles as the charismatic Bronx hip hop club promoter and former graffiti artist, Phade. Fab 5 Freddy is considered one of the architects of the "street art" movement, as what he did in the early 1980s, along with Lee Quiñones, Jean-Michel Basquiat, Keith Haring and others is regarded as the blueprint for artists today like Shepard Fairey, OS Gemeos, Barry McGhee and Banksy. Fab 5 Freddy was referenced in Blondie's 1981 hit song "Rapture". As recounted in the 1999 TV documentary The Hip Hop Years, the "Rapture" video featured Freddy in a cameo role painting graffiti art in the background. (Grandmaster Flash, who was also name-checked in the song, did not show up on the day of the shoot, so artist Jean-Michel Basquiat took his place behind the turntables). "Rapture" was the first hip hop video to be shown on MTV. In 1983, Fab 5 Freddy produced a hip-hop version of "Eisgekühlter Bommerlunder" called "Hip Hop Bommi Bop" together with German punk rock band Die Toten Hosen which is said to be the very first co-production of Punk and Hip Hop. In 1988, Freddy became the first hip hop VJ by hosting the MTV music video show entitled Yo! MTV Raps. He later went on to be an associate producer on the 1991 film New Jack City in which he also made an appearance. In 1994 he directed the music video "One Love" by rapper Nas. In 2007, he played a murdered rap artist named Terrence 'Fulla T' Smith on the TV series "Law & Order: Criminal Intent" in the episode "Flipped". The same year, he made a small cameo in the film American Gangster directed by Ridley Scott. In 2008, he appears as a special wedding guest in the film Rachel Getting Married, along with other notable musicians, as conceived by producer Jonathan Demme to enhance the expansive and varied soundtrack and wedding members, in contrast with the normal duality of a traditional wedding. In 2016, he played the role of Atticus Howard in "Mob Rules" the fourth episode of the seventh season of the CBS police procedural drama Blue Bloods. On August 11, 2017, Freddy appeared, as an animation, in a Google Doodle, which observed the 44th anniversary of DJ Kool Herc's pioneering use of the hip-hop break. ^ a b Kurutz, Steve. "Fab 5 Freddy". Allmusic. Retrieved March 5, 2016. ^ picture of Campbell Soup Cans train with his tag, 1980. ^ "Rapping with Fab 5 Freddy" [interview] in Deitch, O’Brien and Cortez, Jean-Michel Basquiat 1981. Milan: Charta, 2007, page 119. ^ "Rachel Getting Married". Sonyclassics.com. Retrieved 2011-01-29. ^ "Hip-hop history: Google creates epic musical Doodle to kick off 44th birthday jam". 2017-08-11. Retrieved 2017-08-12.